The legacy of the courageous, young war photographer, Gerda Taro, was once buried in history. With the discovery of the photographic negatives, that have come to be known as The Mexican Suitcase, she is being rediscovered and her legacy celebrated. The first female photojournalist to shoot from the front lines, and the first to die there, Taro was recently profiled in The Guardian on the 75th anniversary of her death on July 28, 2014. In 1934 Gerda Taro, then still known by her birth name Gerta Pohorylle, was a Jewish emigre in Paris having escaped Hitler’s Germany. It was there she met Endre Friedmann, and helped create the iconic war photographer Robert Capa. 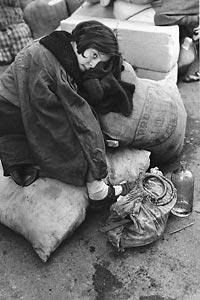 Friedmann, who eventually came to be known as Capa, was a photographer in exile from his native Hungary. He trained her in the basics of photography and helped her secure a position at a Parisian photo agency. Finding it difficult to get their images into the French press as emigres, the two came up with the bold idea to sell their photographs under the identify of a rich American whom they called Robert Capa. The rouse was widely successful, but also whitewashed Taro’s contribution to the genre. In 1936 they went to Spain taking enormous risks to capture imagery from the front lines, and continued to sell their works under the pseudonym Robert Capa. Until recently their photographs were indistinguishable. With the discovery that they used different types of cameras, photographic historians have been able to correctly credit each photographer and the world is rediscovering Gerda Taro. Read more about Gerda Taro in The Guardian and at CBC News.